Eliminate our practice members pain and symptoms as quickly as possible and empower them to realize their full health potential. Welcome to our friendly practice! You can feel the high energy in our fun and lively environment! Langley Chiropractor, Dr. Ben Reid uses up-to-date technology to help you reach your healthcare goals. Our chiropractic care is gentle and completely natural. At Langley Sports & Rehabilitation, we take the time to fully explain what’s happening in your body that’s causing you pain. We’ll provide a thorough exam as well. That’s so we can know precisely how we can help you get on the road to health. In addition to chiropractic care, we offer an array of health-promoting services. Before starting any care, we'll always fully explain what we believe is causing your problems based on your X-rays and thorough examination. You'll be able to proceed feeling comfortable, knowing that you're getting the best chiropractic care for your specific needs. Athletes, construction workers and others who are active may benefit from kinesiology. Registered Kinesiologist Brad Penner provides high-quality, evidence-based therapies. Brad is experienced in modifying customized programs to meet each client's goals and level of performance. Whether you're seeking pain relief or relaxation, consider massage therapy. Massage Therapist Dale Kobialko offers massage and PEMF Services. Registered Massage Therapist Alex Mistiades provides fascial work. Physiotherapy can reduce pain and stiffness. It also may be beneficial if you've been involved in a automotive accident. Physiotherapist Jagjit (Rupy) Kaur enjoys helping patients recover from an injury. She also likes to help them maintain wellness without side effects. As an ancient form of Traditional Chinese Medicine, acupuncture is used to help with many conditions. It can relieve pain, improve sleep, assist with smoking cessation and much more. Mark Kramarik is a Registered Acupuncturist with the College of Traditional Chinese Medicine Practitioners and Acupuncturists of British Columbia. Dr. Reid has an interest in sports injuries, corrective and wellness care. He uses an array of chiropractic techniques. These are designed to help his patients experience pain relief and optimal health. With a Master of Science in Sports Medicine, Dr. Reid also has expertise in helping athletes. We want to show you the results you desire and change your life for the better. 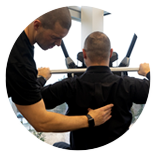 Our complete approach focuses on helping you get your health back. We're able to assist patients of all ages and conditions. Have you been searching for a Chiropractor Langley? Contact us today to book an appointment! Great to find someone who specializes in scoliosis treatment. Always a great place to get help. Having a massage in advance improves my ability to be adjusted, my back is feeling better than it has in many years. I have also gained some of the range of motion that I have lost over the years. Very happy, having the x-rays done there was a great help. Seeing what was wrong and how they can help me was fantastic!! Dr. Blonski is knowledgeable and really cares about helping me return to better health. I definitely feel I am in good, safe hands and appreciate his gentle yet professional ways. You are very professional in every way. I have already recommended your clinic to my friends. You guys rock! Keep up the great work!!! Thanks for the alternative solutions you offer. It is powerful to have options other than the mainstream solutions traditionally available. You support proactive healthcare. Thank you! First treatment was very different! Never had an adjustment before. But Dr. Ben Reid was very awesome explaining the steps and what to expect. Beautiful office! Great group of people. Would and have recommended your office to everyone. I work in Vancouver, live in surrey but will continue to commute to this office because they are that good! I’m very happy with the level of knowledge and quality of care. Thank You! Best service ever! You go over and beyond in service, you work with clients and explaining extremely well. In just a few visits, I am feeling stronger. There is a connection to the ground that I haven’t felt in years. I don’t feel 50 years older than I actually am anymore! This was the first place where someone took my pain seriously and understood what I was going through. Brad for physio exercises was fun, upbeat, positive, encouraging and helpful. He is very knowledgeable, listened to my problem and explained ‘how to fix me’ in a way that I can understand. I definitely recommend to anyone with back pain &/or problems. Dr. Reid is very knowledgeable and personable as well as his staff. I highly recommend them! Great for me to find a location that is exactly targeted toward all levels of athletes, has all of the knowledge as well as the most up to date equipment, analysis techniques, and methods for rehabilitation. I thought everything about it was so interesting and I really liked it. Thanks for helping me feel at “ease” on my first couple visits! You were all so helpful, and I look forward to my next appt! I was going to write you to express my gratitude for your expertise. I have been able to walk in comfort, and my body is shifting back to where it’s was before my unfortunate experience. I know I’ll be more in balance with each visit, and I can’t thank you enough. Dr Reid was patient, listened and did not rush!! I was quite surprised with the time spent on an initial visit. Professional staff, great experience; I would not hesitate to recommend your practice. Appreciate the thoroughness and care received. Highly recommend! Thanks for accepting a new patient so fast!!! So glad I was able to get in the next day. I have only had 2 appointments so far and was impressed by the professionalism and felt confident that I was going to be helped. After both sessions I felt noticeably better and look forward to the next visit! Great practice. I will definitely be recommending you to others! I feel confident that my needs will be taken care of! Dr. Reid is personable, thorough and professional. He is knowledgeable and good with kids too. Extremely grateful for the referral. The competency and knowledge along with the genuine empathetic care I received was the best I’ve ever experienced. Thank you. Very pleased with on going results of regular massage therapy, very skilled and professional. Greatly enhances chiropractic treatment – would highly recommend that both treatments be combined for best results . The staff were very helpful, very professional, and provided service with a smile! Very welcoming staff. Exactly as I had expected having been recommended to you! My shoulder has had nagging pain from an injury back in April 2018 and after one shockwave treatment, I don’t feel it. Very looking forward to further treatment and the road to recovery, thank you! I look forward to continuing my treatments. I felt I found a great all round practice. Thank you. I was very impressed with the professional, friendly, and very helpful practitioner. I appreciated very much Dr. Reid’s sensitivity to the fact that after seeing Dr Irving for years I was nervous about seeing another practitioner. He listened very carefully and showed total respect.That was very much appreciated. Everybody I came in contact with, were friendly, helpful and approachable. I felt very comfortable.